I'm glad that these turned out better than I thought they would...because they were absolutely delicious! 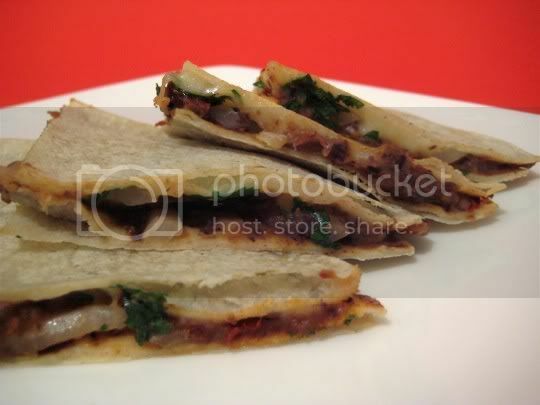 Every ingredient in these quesadillas really stands out, so you're going to get a mouthful of different flavors with each bite. Best of all, you'll have a surprisingly filling meal in no time. Simply puree (or mash) a can of black beans, plus chopped chipotles and brown sugar for smoky sweetness (plus a little water to make the mixture spreadable). The bean mixture actually tastes very similar to those amazing BBQ black beans at El Pollo Loco. Although quesadillas are usually made with flour tortillas, using corn adds a more complex, homey flavor. Spread the bean mixture on one tortilla, and sprinkle Monterey Jack (or quesillo, which I couldn't find) and cilantro on another, then top with fresh sliced onions. I thought the raw onions would be a bit much, but they do soften with cooking. Press the two tortillas together, cook on both sides, and eat! The bean mixture is spicy and sweet, the onions add a pungent crunch, the cheese adds a light saltiness, and the cilantro is tangy with a slight citrusy note. Amazing flavors, all in one dish! Serve with a salsa of your choosing for some additional tang. Make again? Definitely. The bean mixture is good for leftovers, and you'll want to keep tortillas on hand for this quick and delicious meal.